According to bathroom vastu, bathroom should be located in North or North-West portion of the house. If bathroom is located in wrong direction, it can cause health and financial problems. Bathroom should not be in South, South-East and South-West direction. South sided bathroom can cause adverse effects on the health of female members. As per Toilet Vastu, toilet should be located in west or northwest direction. Avoid construction of toilet at the centre and in the east, northeast of the house. The toilet seat should be placed in such a way that the person sitting could face the North or the South. Now a day toilet combined with bathroom is becoming popular due to lack of space. Combined bathroom and toilet should be in north-west direction. It should not be adjacent to Pooja Room, kitchen and under the stairs. 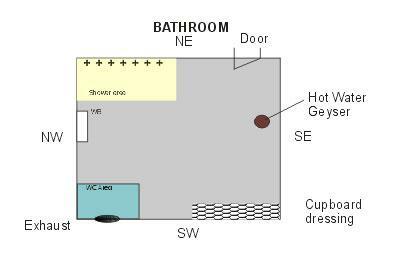 Geyser and other electrical appliances like heater and switchboard should be installed in south-east corner of bathroom. Taps and showers are fixed in north direction. Placing bath tubs in east, west or north-east direction is good. Wash basin and shower can be either in north-east, north or east direction. The North is a good direction for vanity mirror. Water closet should be placed in the West and the South direction of the toilet. A water closet should be placed near a window or an outer wall. Exhaust fans are necessary if there is no window in the bathroom. The slope of bathroom floor should be in the North. It should not to be in south-west or south-east direction. Septic tank should be in northwest of the house. It should not be in south-east, north-east, north or east directions. The tank should be higher than floor level of the building. The door of bathroom should be in North or East direction. It should not be placed in south-west direction. In a bathroom there should be a small and airy window either in East, West or North direction. If the window is in south direction, it would have adverse effects on health. The color of bathroom tiles can be white, sky blue and light blue. It helps in giving a fresh look to bathroom. Avoid dark colors like black or red. The slope of floor in bathroom should be towards East or North direction. It should not be located in east, north or northeast direction. It should not be in northeast and center place of the house. It should not be near kitchen and under the stairs. If a change room is built in bathroom, it should be in South or West direction. The mirror should be on northern or eastern wall. The door should not be in south-west direction. Washing machine can be placed in south-east and north-west direction directions.